It’s a sun-kissed day in late February at Salt River Fields in Scottsdale, Arizona. 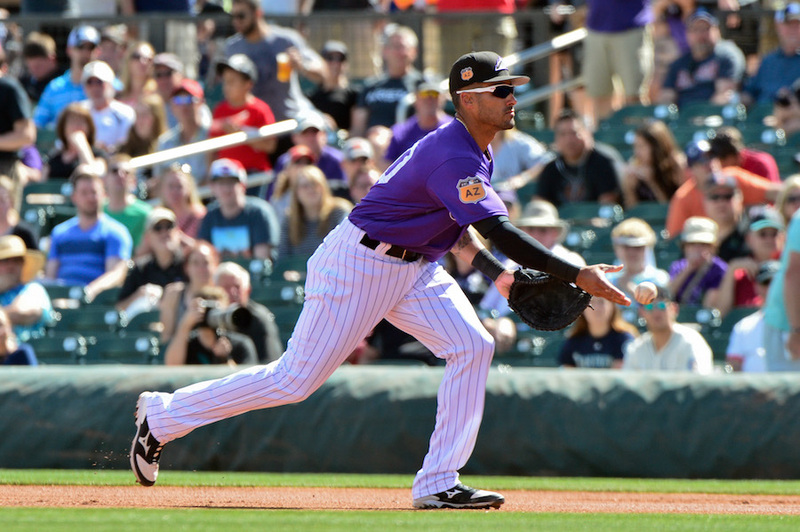 Ian Desmond is feeling refreshed, relaxed and ready for redemption in 2018. As he waits for his turn in the batting cage, he hears a child’s voice that makes him smile. 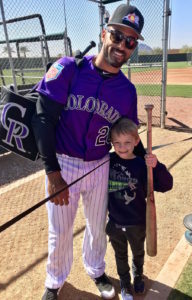 “Hey, Ian Desmond,” shouts 7-year-old Grayson Endris, who is watching intently behind one of the Rockies’ Spring Training fields. After a few hacks in the cage, Desmond breaks his bat and immediately passes it through the fence to Endris. Not only did Desmond give Endris the bat, he told the young baseball fan (who shares the same first name as Desmond’s oldest son) to meet him after workouts so he could sign it. Grayson, who pitches and plays shortstop (one of the many positions Desmond plays) is well-versed in players and teams thanks to the video game “MLB: The Show.” He has roughly 5,000 baseball cards and a handful of autographed baseballs and photos. He will put his latest addition, the signed bat from Desmond, in a special display case in his bedroom alongside the other memorabilia. To say Desmond’s thoughtful gesture made an impact would be an understatement, suggests the proud father. Also rooting for Desmond’s success? Rockies ownership. General Manager Jeff Bridich. Manager Bud Black. Teammates. Fans. Friends and family. And of course, Desmond himself. 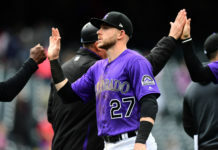 After signing a five-year, $70 million contract with the Rockies in December 2016, the two-time All-Star had a frustrating 2017 in which he broke his left hand in spring training and later made two trips to the disabled list for nagging calf injuries. He missed a total of 67 games, by far the most games he’d ever sat out. In six of his previous seven seasons Desmond played at least 154 games for the Nationals (2010-15) and Rangers (2016), so the injury bug was something new for the 32-year-old. In the 95 games he did play, Desmond hit a solid .274 with 7 home runs, 40 RBIs and had a team-high 15 stolen bases. He also finished with 93 hits but only a .375 slugging percentage and admittedly never got into a rhythm. Even so, he did his best not to get discouraged. Desmond says the biggest disappointment from last year was how things unfolded after the initial excitement by all parties. Desmond was so determined to be a good teammate and honor his contract with the Rockies last season that, behind the scenes, he went well above what was expected. It’s not widely known that aside from his rehab assignments Desmond didn’t miss a single game, home or away. He traveled with the team and sat in the dugout, in uniform, even when he was hurt. “I was really excited to come in here last year and help this team get over the hump and make it to the postseason and bring winning baseball back to Colorado,” Desmond said. “I may have bit off more than I could chew. Looking back, I was really eager to get back on the field. Maybe I rushed that a little bit. Or maybe I could’ve stayed home instead of traveling on the road and allowed my body to heal a little bit or taken a longer DL stint. “I just really want to show the fans and my teammates who I am. They still don’t know who I am as a player. These guys have seen me play two series a year and what they’ve seen on TV, but they don’t really know who I am on a daily basis either. Last year wasn’t a very accurate representation. The Rockies had big expectations when they signed Desmond, and for good reason. He was coming off a year where he was named an All-Star with Texas, despite switching positions from shortstop to outfield. His offense was on fire – a .322 average, with 15 homers and 55 runs batted in – leading up to the Midsummer Classic. He cooled off in the second half, but still finished 2016 with respectable numbers (.285, 22 HR, and 86 RBI). Before that, while with the Nationals, Desmond was named an All-Star in 2012 and won the Silver Slugger Award three straight years (2012-14). And in four of his big league seasons (2012-14, 2016) he’s had at least 20 home runs and 20 steals. Desmond’s defense, overall, has been consistently good, as well. Since he broke into the majors in 2009, his career fielding percentage is .964 and he’s committed just 165 errors in 4,612 chances. Heading into 2018, Bridich still has big expectations for Desmond and describes him as a multitalented player with a lot of upside. For those who are concerned about Desmond being injury-prone again this season, don’t be, he assures. And hopefully a lot of baseball left to play. Desmond says look for a “new-and-improved” version of him in 2018. He credits maturity, the experiences of last year and yoga for helping him get into a healthy state-of-mind. This offseason, he did one-on-one yoga sessions with an instructor five days a week back home in Sarasota, Fla., which helped bring some life back into his body. Desmond has done yoga off and on for a few years, but not consistently. After beating up on his body over the last decade-plus, he was looking to gain strength, flexibility and meditation, and he did. Desmond continued to practice yoga throughout Spring Training and will do so during the regular season, as well. In addition to getting his mind and body right, Desmond also tweaked his game ever-so-slightly. Because last year was choppy for him, he made an adjustment during the offseason in hopes of getting his timing shored up at the plate. He lowered his hands to get more extension on his swing and has been going with that approach ever since. Desmond, meanwhile was impressed by Bridich’s enthusiasm and game plan for all the Rockies’ young talent. Desmond peppered the young GM with questions and Bridich was ready. The men talked about life, baseball and all sorts of things. Both sides were equally impressed with what the other had to say, which ultimately led to Desmond signing with the Rockies. The caveat was that Desmond was slated to be the team’s starting first baseman, which would be a new position for him. He spent his first several years in baseball as a shortstop and switched to outfield in 2016 when he signed with the Rangers. But Desmond wanted to play and was up to the challenge. In preparation for Spring Training with the Rockies last year, Desmond says he “took thousands and thousands and thousands of ground balls [at first base] and didn’t practice outfield one bit.” When the hand injury happened just a couple weeks into Spring Training, Desmond was behind the 8-ball to get the reps he needed. He missed several weeks and only played 27 games at first base in 2017. Mark Reynolds took over the first base job and was solid on both offense and defense, meaning Desmond needed to find a new position. He ended up playing 66 games in left field, one in center and one at short. The question remains, where will the talented veteran, and highest-paid Rockie (at $22 million this season), play in 2018? The good news, says Black, is that “Desi” is the type of multifaceted ballplayer every club would love to have. Desmond says he wanted to be a Rockie in 2016, the year before he signed with Colorado, but the timing wasn’t right. The next year when free agency came around, the Rockies were on board. And so began the conversations with Bridich and others in the organization, including first base prospect Correlle Prime. Desmond and the 24-year-old Prime met through Desmond’s high school hitting coach, Dwayne Strong, who was Prime’s high school coach and mentor. As Desmond enters his second full season in Colorado, he continues to get to know his Rockies teammates. At 32, Desmond is considered an “elder statesman” on the Rockies roster. Only catcher Chris Iannetta (who turns 35 this month), Mike Dunn and Wade Davis are older, and the two pitchers are just barely senior to Desmond. 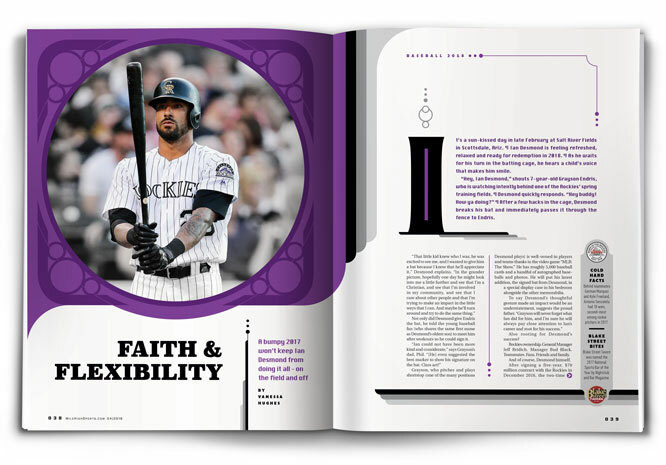 While Rockies fans anxiously await the season (and the opportunity to see if Desmond can be the player both he and Bridich believe he can be), they’ll also be afforded the opportunity to get to better know Desmond as a man. And regardless of injuries, position or salary, that’s never been in question. He’s much more than the gifted athlete who wears No. 20 for the Colorado Rockies. He’s a man of faith, a husband, father, philanthropist, friend and great teammate. He’s active in his church and participates in a Bible study back home. He’s hoping to start one in Colorado with some of his Rockies brothers-in-Christ. He strives to be a positive example for the organization, the fans and the community, and makes giving back a top priority. Just like the small gesture of kindness he showed to Grayson Endris, to know Desmond is to know that’s par for the course, says Bridich. Desmond is also a husband, to Chelsey, whom he met in fifth grade in Sarasota. Thanks to AOL instant messenger, the two reconnected one night while Ian was in the minors in Woodbridge, Va. He was getting ready to type Chelsey a note and chickened out. At that very moment, she sent him a message and they haven’t stopped talking ever since. The couple was married in 2010 in their Florida hometown; they now have three boys – Grayson, who turns 7 on April 26, Cruz, 5, and Ashton, 3 1/2. When Grayson was born in 2011, Desmond was the first MLB position player to be placed on paternity leave when he took time off to be with Chelsey after she gave birth. Having three young, active boys keeps the Desmonds very busy, but they wouldn’t have it any other way. Ian has a “Family” tattoo as a permanent reminder of his loved ones. There are many causes that are close to Desmond’s heart and he’s extremely generous with his time and money. During Spring Training last month, Desmond organized an equipment drive for the Salt River Pima Maricopa Indian Community at the Rockies-Diamondbacks joint complex. Both teams collected sporting goods, school supplies and money to help the people in the community because, as Desmond put it, they’ve been great to the Rockies and there’s a huge level of poverty and a lot of people that do need help. Afterwards, Desmond and others dropped off the equipment at the youth center and spent time with the kids, played games and gave away prizes. Desmond is also excited about a skateboarding fundraiser he’s helping put together this summer at the skate park near Coors Field to raise awareness for NF. In addition, he wants to reach out to the Denver Islamic Society to let them know that they have a friend in him and hopefully a friend in the Colorado Rockies. “We’re all brothers and sisters from God, and I feel like it’s unfair for them [all] to be looked at in a bad light. We should love our neighbor. There’s so many differences, but that doesn’t need to keep us from being friends,” Desmond explains. He’s volunteered for events with Big Brothers/Big Sisters of Colorado and the Boys and Girls Club as well. Those charitable efforts do not go unnoticed by the Rockies’ brass. It’s one of the many reasons they hold Desmond in such high regard. Desmond left his philanthropic mark on previous MLB stops as well, especially with the Expos/Nationals organization, which drafted him in 2004 (84th overall). 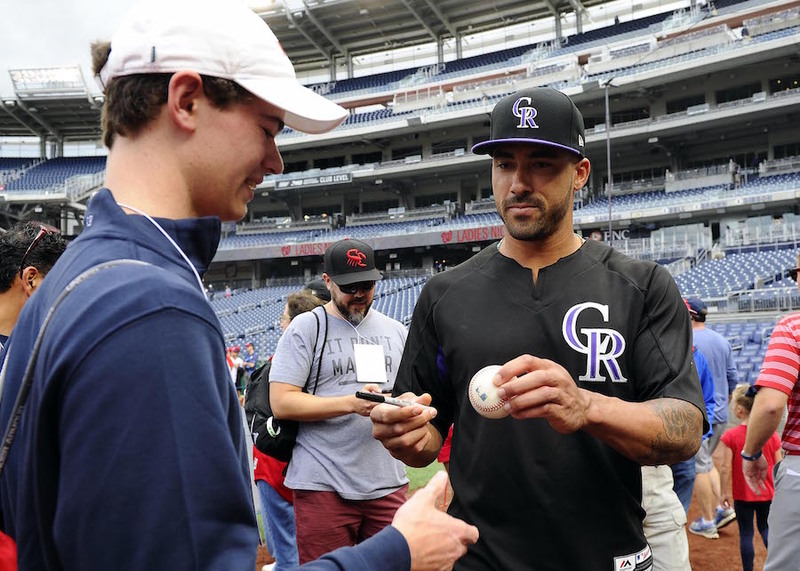 It’s something Black noticed when the Rockies played in the nation’s capital last summer. Colorado is Desmond’s baseball home for the next four years. The 2018 season offers a fresh start and he couldn’t be more ready to turn things around. The talent is there. The expectations are there. The time is now for Desmond to show what he can do.